Spridget50 March 2008 Press Release. 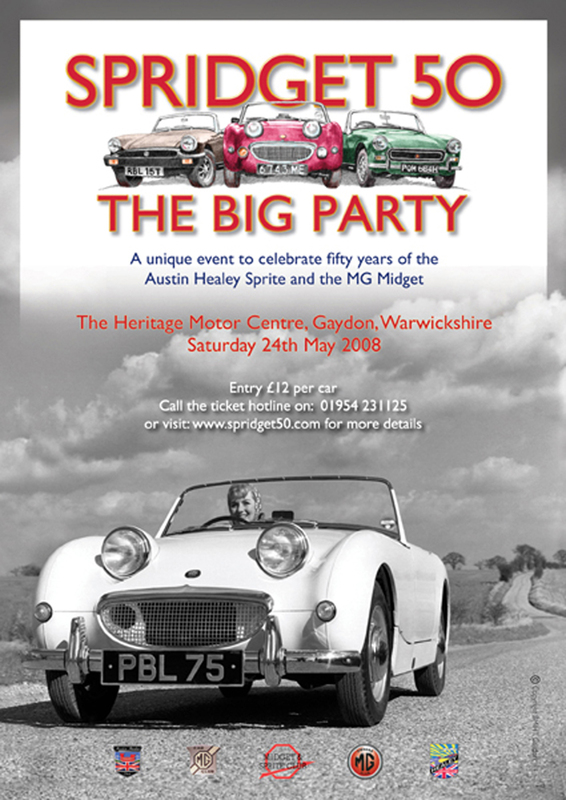 “Spridget50” the Birthday Celebration to be held at the Heritage Motor Centre Gaydon on Saturday 24thMay 2008 is shaping up to be the largest collection of Sprites, Midgets and derivatives ever congregated in one place. 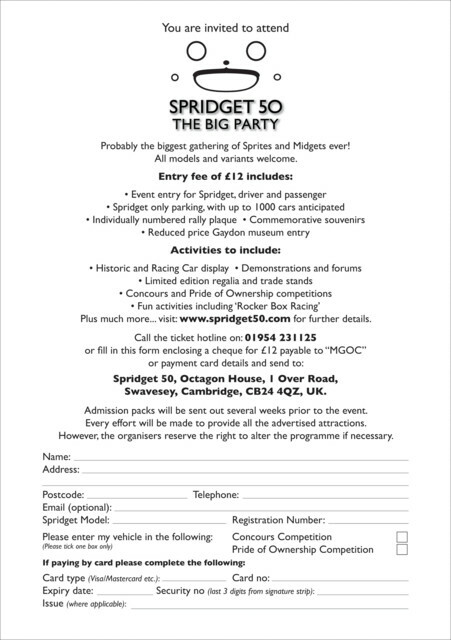 Members of the Midget & Sprite Club, Healey Drivers Club, MGCC, MGOC and Austin Healey Club have joined together and the aim of gathering together 1000 Sprites and Midgets is quickly becoming a reality. Many rare and historic cars such as the original press car “PBL 75” and John Sprinzel’s Sebring Sprite “PMO 200” will be joined by currently raced examples along with drivers and personalities from the past to the present. We have the pleasure of welcoming prominent members of the Healey family and can now announce two very special guest speakers, Don Hayter, responsible for the production of the Frogeye Sprite when it came to Abingdon and the Former Chief Engineer of the M.G. Car Company and Mike Garton, prominent Spridget racing driver and author. Other events on the day will include Midget & Sprite Auto-jumble and Trade Stands and we are delighted to say that both the Concours and “Pride of Ownership” competitions have almost reached full capacity. For those interested in less Spridgety pursuits there is the Gaydon Motor Heritage Museum as well as the Land Rover 4 x 4 Off-road experience, Go Karts and Miniature Roadway in addition to a Nature path and Children’s playground. More news will be announced closer to the day but in the meantime if you would like your Spridget to attend the Birthday Party and receive the special joining and entry pack please book online or download the application form at http://www.spridget50.com alternatively call the ticket hotline on 01954 231125. Does anyone know if there will be a 55th birthday party in 2013 ?